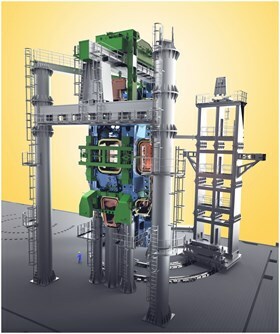 As the doors of the Assembly Building open to admit the first vacuum vessel sectors shipped from manufacturing sites in Europe or Korea, two imposing custom-built tools will stand ready to receive them. Six storeys high, with wings spreading 20 metres, the sector sub-assembly tools will work side by side to equip the nine sectors of the vacuum vessel before their transfer to the Tokamak Pit, where they will be welded together to form the torus-shaped ITER vacuum chamber. Six stories high, made of 800 tonnes of steel, the Sector Sub-Assembly tools will work in concert to equip the nine sectors of the vacuum vessel before their transfer to the Tokamak Pit. "It's far from a simple operation," says Emma Watson, an engineer who works within the Machine Assembly & Installation Section at ITER. "For each of the nine sectors, the complete sub-assembly operation will take five to six months." To optimize the overall schedule for the nine sectors, two identical tools are planned, each one capable of holding a sector on its end while positioning—and aligning—the associated components. Standing shoulder to shoulder, two Sector Sub-Assembly tools will suspend the vacuum vessel sectors from the top while carefully positioning and installing—via the rotary motion of the ''wings''—the vacuum vessel thermal shielding and two toroidal field coils. The sectors, which will travel from the factories in a horizontal position, will first have to be "upended" by a dedicated tool that is designed to lift the 440-tonne (max) vacuum vessel sectors (7.6 x 6.5 x 13.7 metres) and the 310-tonne toroidal field coils (9 x 3.7 x 17 metres) into their final, vertical orientation. Then the sector sub-assembly tools will take over, suspending each vacuum vessel sector from its top while carefully positioning and installing—via the rotary motion of the "wings"—the vacuum vessel thermal shields and two toroidal field coils. The sub-assemblies will be maintained in place as the remainder of the operations that must be completed on each 40° sector (such as the installation of some diagnostics, inter-connecting structures and cooling pipes) are carried out. Made from 800 tonnes of steel, the 22-metre-tall tools will be capable of supporting, aligning, and stabilizing the vacuum vessel sectors and the toroidal field coils independently through a sophisticated array of precision actuators and sensors. "The assembly of the first sector will take the longest time, as assembly procedures based on the results of tests (involving partial component mockups) are honed via the experience gained as the sequences are performed for the first time on real components," says Emma. At different stages in the sub-assembly process, metrology surveys will be used to verify the components' positions. 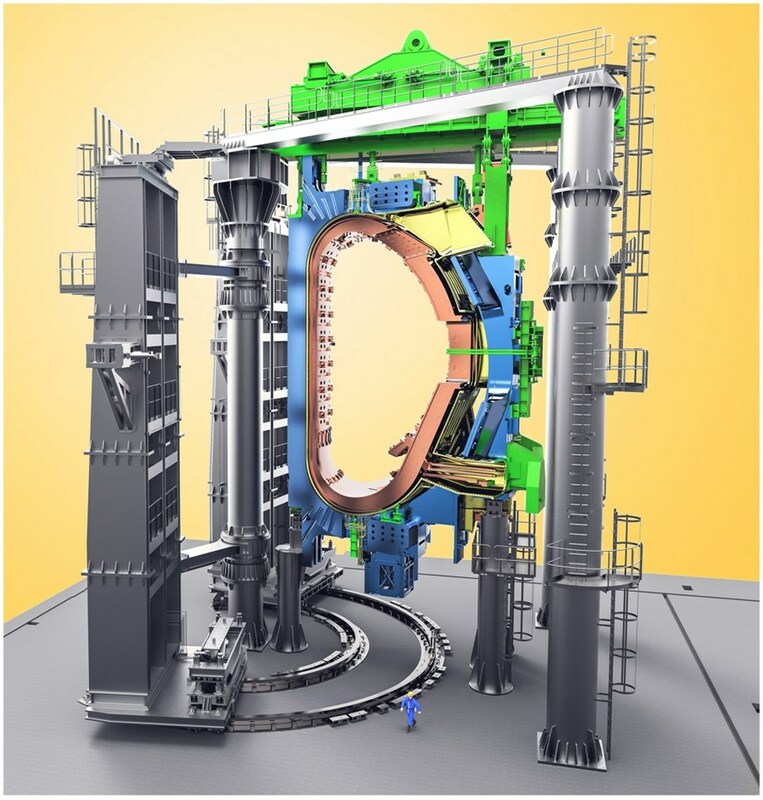 At the end of the process, the final sub-assemblies, weighing a maximum of 1,200 tonnes, will be transferred by the two overhead cranes operating in tandem to the Tokamak Pit. As part of its procurement contributions to ITER, the Korean Domestic Agency is responsible for the design and fabrication of the sector sub-assembly tool as well as 128 other purpose-built assembly tools. Korea is responsible for the design and fabrication of the Sector Sub-Assembly tools as well as 127 other purpose-built assembly tools. From 6 to 8 October 2014, a Design Integration Review took place at ITER Headquarters for the first batch of 23 tools. Late October, at ITER Headquarters, a design integration review was held for a sub-group of 23 tools, including the sector sub-assembly tool, in order to assess design progress prior to the final design review planned for December. The review brought together representatives from the Korean Domestic Agency as well as ITER Organization personnel from the Machine Assembly and Installation and Design Integration sections, and the main interfacing parties for this group of tools (toroidal field, poloidal field, vacuum vessel and thermal shield). For three days, the group assessed the design readiness for each tool, verifying documentation, engineering calculations, analyses, interfaces and access. The successful outcome of this review is a clear indicator that the design of this first group of 23 tools is sufficiently mature to achieve final design review status—a prerequisite to starting manufacturing preparations. The final design review for this group of 23 tools is scheduled in December. See a short video sequence of the sector sub-assembly tool in action here.